A real photo of Bret; not a photo of my real tummy. Sigh. It occurs to me that I may be a little rigid about my workout routine. A trainer at the YMCA set it up a couple of years ago, and I haven’t changed a thing. The resistance machines are first. I start on the left side and continue along the front row. Then I do the 2 thigh machines in the third row, and 2 sets on the sit-up machine. I finish up with 22 minutes on the treadmill and a 5-minute cool-down. I’m on a very tight schedule. If I leave the office at 5, I have barely enough time to get to the Y, get through the weights and sit-ups and get to the treadmill (one in the back rows with its own TV) no later than 5:40 central time. I can’t miss Bret Baier’s All Star Panel discussion on Fox News. If I’m running late, something’s got to give so I can be in front of the TV by 5:40. The sit-ups are the first to go. If I weren’t rushing to watch this show, I’d be doing lots more sit-ups and I’d have rock-hard abs. 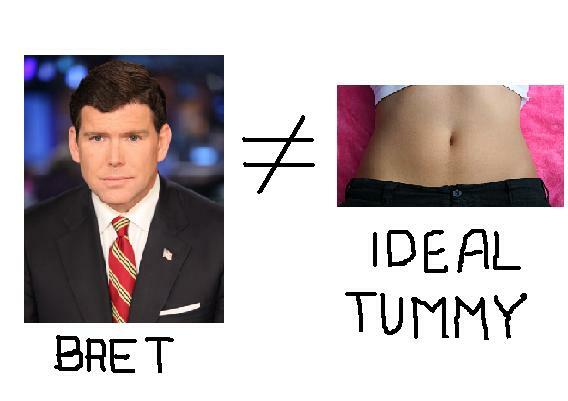 I hold Bret Baier personally responsible for the flabby state of my abdominal muscles. I’m open to many political opinions – right, left and center. While I find Fox’s endless erectile dysfunction commercials somewhat off-putting, it doesn’t matter. I’m hooked. I don’t even watch the whole show, just the panel discussion. They have a rotating pantheon of experts and most of them are good. If I’m being honest, it doesn’t matter who else is on the panel. I watch the show mainly to see Charles Krauthammer. I have a bit of a thing for him. It’s much more than the usual girl/boy crush – I admire Charles for his mind. His analyses are well thought out and succinct. Whether delivered with the sternness of a judge or a wryly self-deprecating smile, his opinions are generally spot-on. I think he’s married, and I’m sure his principles are much too lofty to allow for any fooling around. Oh, and mine, too. My principles are really, really lofty, too. I was thinking of a more cerebral coupling, something along the lines of the Vulcan Mind Meld. I just hope the purity of my intentions keeps this out of Jimmy Carter’s “already sinned in my heart” category. I am not delusional. I know this relationship is going nowhere, but a girl can dream. 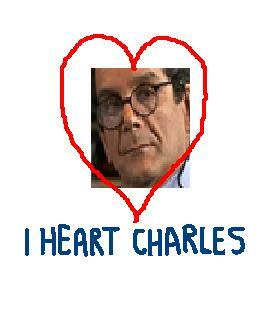 Perhaps, someday, Charles and I will meet, if only in writing. We’ll trade witty, yet profound, commentary on the state of society. I will be an acolyte, sitting at his cyber feet. He’ll chuckle at my blog. I’ll cherish every communiqué. Until then, I’m going to try to be a little more flexible about my workout. Maybe I should start with the treadmill, then go to the weights and finish with the sit-ups. I could add ½ hour to the workout, cover everything, and really get this body in shape! Nah. See you tomorrow, Brett, Charles. 5:40 central time. This entry was posted in General Ramblings and tagged Bret Baier, excercising, Fox News, health, humor, life, postaweek2011, working out. Bookmark the permalink. Seems to me that one could argue that a finely tuned mind and/or a middle life crush is far more important (not to mention achievable) than rock hard abs. Don’t change a thing! That’s great advice for any facet of life – if you set your goals low, you’ll always be an overacheiver! I am stunned! C.K.? Wow! I admit that I’ve got a little thing for K.O…..yep, you know THAT K.O. from MSNBC…..crazy, huh? I am equally stunned! There was a very dweeby guy that I had a crush on freshman year in high school – total nerd, but I found him fascinating. Who can explain what the heart feels? …..and a “girl crush” on R.M. also of MSNBC…. feel the same way about c.k.,but I think there is more than high morals and a wife to stand in the way of “fooling around” with him.Poor baby is quadriplegic-no function or feeling from the very upper chest down. He can bend his elbows and use his wrists,but has no use of his hands-maybe a little feeling in the thumb and index finger. How he can still be so confident and charismatic is a wonder that we can both enjoy from afar. Thanks for reading this old post. The affair bit was tongue in cheek. I wouldn’t mind an intellectual entanglement, although I don’t think I’m up to his standards. I so agree with you – his confidence in the face of adversity is astounding. I think the man is brilliant. Obviously I’m smitten – so where do I sign up for the CK Fan Club? We should start one! I’m just learning to use the computer now in my old age, so you’re a lot more skilled at this than I am. C.K. has a facebook page and twitter page but it’s all very political and not terribly personal. I wonder if there are any more “ladies” like us (more me,I guess) who are a little bit infatuated with this unusual man. Oh well, even If there isn’t I’m glad I could share a bit of a gush with you.